We LOVE audio books. LOVE them. But let me start by saying in no way do I think they take the place of reading with the kids – they are not a substitute for that one on one time but they are a great ADD-ON, an extra way for the kids to enjoy stories. I have seen some comments about Audio Book and people are not sure so I thought I would explain why we love them so much. I first bought the kids some audio stories as a way of entertaining them on our car trips. My youngest gets car sick and can not read while in the car and we don’t use devices either (iPads tends to get mine overwhelmed which is not great when you are going out as you want them to arrive calm). It was a few year ago and they were still very much into Julia Donaldson so I bought the Julia Donaldson audio collection for them. The stories were great, well told and mine loved listening to them on our car trips. As soon as we started listening to them I noticed two things – firstly after listening to a story the kids would come home and dig out the book and read it to themselves or read it with me. Listening to the audio books actually encouraged them to read more. Secondly when they would read the stories themselves they started to add more and more expression, I loved the expression they added. After that I bought them the Ladybird Classics The Complete Audio Collection. Now this one has longer stories and the story versions are more “old-fashioned”. But my kids loved them. 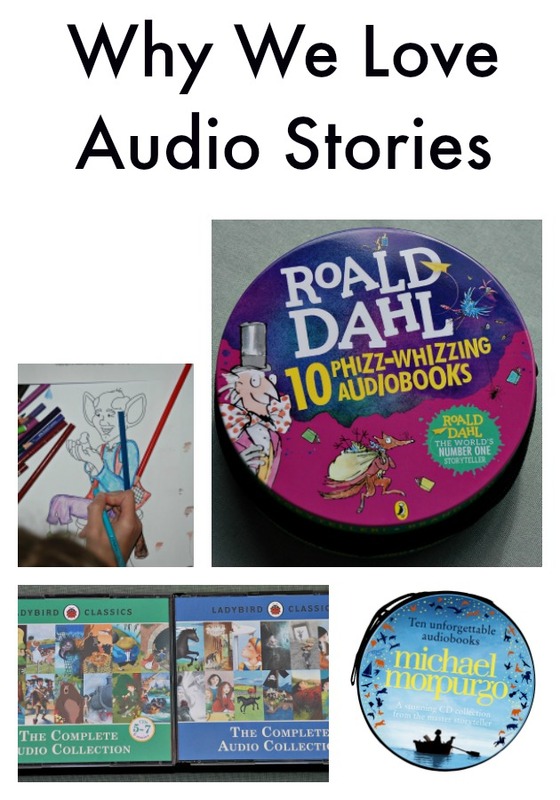 The audio collection introduced them to lots of classics – The Jungle Book was an instant hit, and so was Little Women, Heidi, the Secret Garden, Three Musketeers and so many more. And as they listened to the classics they started wanting to read the classic stories themselves. We hunted down many copies at our local library (I think my daughter has now read three different versions of The Wind in the Willows – all because she loved the retelling from the audio collection). We also started to build up our own collection of more classic stories for the kids. And once again after listening to the stories both of mine spent ages reading and re-reading the stories themselves. And the classic collection had the added benefit of introducing them to some new topics. Oliver Twist resulted in a discussion about what being a child in the Victorian age would mean and what Workhouses were. Little Women resulted in discussion about how in the past women were not treated equally. The Railway children resulted in a discussion about how someone innocent might end up in jail. Listening to these stories often started fascinating conversations. And both of mine have listening to them multiple times. In fact if one of the kids were sick they would take the audio stories up to their room and listen to them while they lay in bed. The Classic story collection was such a big hit with my kids and I could see how much they were gaining from the audio stories so I recently bought them the Roald Dahl set as well. I have come to really love these sessions. And with the Roald Dahl stories we still read the books – not only did I read the BFG tgether with the kids cover to cover but my daughter has now read it herself twice and my son has read James and the Giant Peach on his own. We have really found audio books enhance the kids enjoyment of reading. They always read the books either before of after they listen the stories, often multiple times, they read with more expression and understanding, they are relaxing and great for entertainment when kids are under the weather and now they have even been included in our art sessions. And I have no intention of stopping. I happen to know my oldest is going to find the Michael Morpurgo Audio collection under the tree this year. Please note all the Audio Collections / audio books that I mention in the above post were purchased by me. I have included links back to the Bookpeople because that is where I bought our sets from. This is NOT way a sponsored post. I did ask the bookpeople for an image of the Michael Morpurgo set as I have not yet bought one for my daughter. This entry was posted in Homeschooling and tagged Audio Stories, children's book, Children's Classics, home ed, home education, homeschooling, Roald Dahl. Bookmark the permalink. I agree. Audiobooks are a wonderful addition to a literate life. Children can be exposed to a richness of language and literature they wouldn’t be able to access through their own reading – yet. It opens up new worlds and ideas to explore and helps fill those moments when the body is occupied but the mind is free. I listen to audiobooks every day. We never got into audiobooks much until recently but my teenage son and I have enjoyed a couple series together on our drives to and from a morning class he has now. Looks like you’ve chosen some fun audiobooks for your kids.